Whether you're an experienced investor or you're just getting started, we can provide you with comprehensive and effective real estate solutions in the downtown Vancouver condominium market. Plan A allows you to purchase, furnish, rent, manage and sell your properties with a single point of contact. 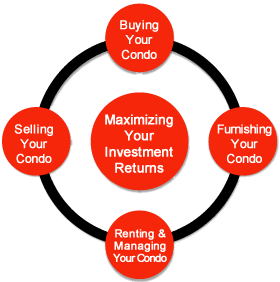 The principals of Plan A have been successfully investing in the downtown Vancouver condo market for over 10 years. We have the proven expertise to identify properties which are going to generate above average investment returns. Not all condo properties perform equally. . . we know how to pick the winners. One of our strategies for triggering above average returns is to rent properties as furnished units. We have the contacts and expertise to get your unit furnished quickly and affordably. All you have to do is say: "Let's do it!" The principals of Plan A have achieved an occupancy rate of over 99% over a period of more than 10 years. We take a lot of pride in consistently keeping our properties occupied by qualified tenants who pay rents which generate high investment returns. Although we highly recommend a long term 'invest and hold' strategy, we can assist with selling your property if that's the course you choose. Our in-depth knowledge of the Vancouver condo market and strong marketing expertise will ensure that you attain maximum value.